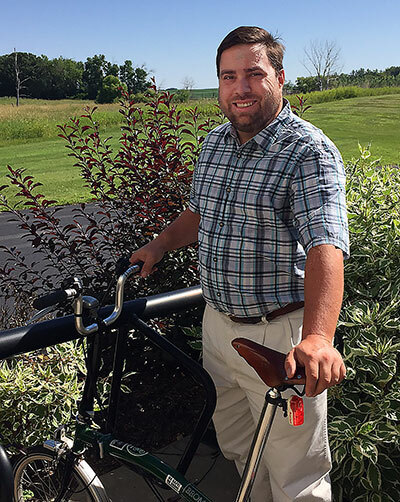 When West Central Initiative’s newest staff member, Transportation Planner Andrew Besold, flew into Fargo to scout out housing in Fergus Falls, he came with a collapsible bicycle in tow. A week later, he drove cross-country from New Jersey with two more bikes strapped to the top of his car. This isn’t so surprising once you learn that, for Andrew, cycling is a passion and his preferred means of transportation. Andrew joins the planning team at WCI to work primarily on active transportation projects, including pedestrian and bicycle planning, Safe Routes to School, trails planning and more. In addition to his role in active transportation, he will also work on other transportation projects for WCI, including scenic byway planning. Andrew received a master’s degree in city and regional planning from Rutgers University, with a concentration in bicycle and pedestrian planning and safety. Prior to coming to WCI, he was a public lands transportation scholar with the Western Transportation Institute stationed at the Sawtooth National Recreation Area in Ketchum, Idaho. There he helped design multi-use trails and analyzed data on transportation patterns and the environmental impact of trails. He has also worked as a bicycle safety educator with Bike New York, and a cycling tour guide and active transportation research assistant with the New Jersey Bicycle and Pedestrian Resource Center. He is certified as a League Cycling Instructor by the League of American Bicyclists. “Andrew brings a great mix of education, expertise, and excitement about active transportation to our region and to WCI,” said WCI Planning Director Wayne Hurley. "His previous work with Safe Routes to Schools programs in New Jersey will bring a fresh perspective to our SRTS planning work." “Minnesota has a great reputation for being at the cutting edge of active transportation planning. It is ranked the #2 most bicycle friendly state by the League of American Bicyclists. I am very excited to bring my skills and experience to a state that really understands the importance of active transportation and specifically to the West Central region,” Andrew said.